This is a Sponsored post written by me on behalf of Sharpie® for SocialSpark. All opinions are 100% mine. Want an easy DIY project for these holidays seasons? Look to Sharpie® for your DIY needs! I love their new Metallic Sharpie® permanent markers. Like the ones used to embellish this neat little ceramic bird below via Dream a little Bigger. Who doesn’t love Sharpie®?!? There is always a reason for using a Sharpie® product, especially now that it’s the Holiday season! I use them for everyday needs around the house but they also can serve as a basic tool for embellishing and DIYing. Who says you need an expensive paints and tools to make something. Sometimes all you need is a Sharpie® pen and some creativity. For instance I really love this simple plate embellishment via The Plumed Nest. 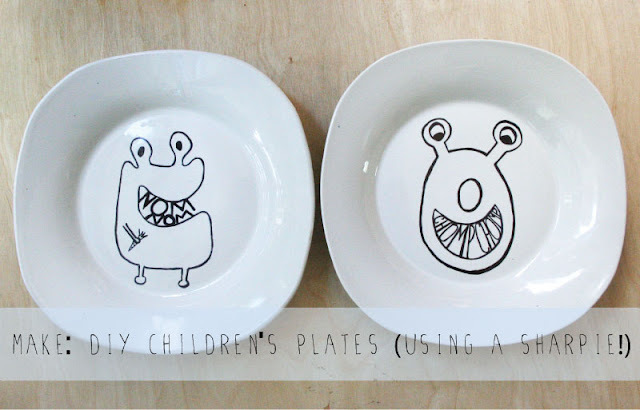 You can use the Sharpie® Paint Pens which are non-toxic to make your own versions. Heck, you can deck the halls with all the gold, silver and bronze you want with the new Metallic Sharpie® permanent markers! And the fine point Sharpie® marker is perfect for writing out gift tags. Think of decorating simple ball ornaments with the kids, holiday place settings, greeting cards, present embellishing. The holiday possibilities go on and on. Get more Sharpie® inspiration at their Holiday Happenings Pinterest Page. No need to stop there! If you’re looking to add a little color to your season, Sharpie® fine point permanent markers are available in a convenient 12 count package – so that every color you could ever want is at your disposal. Tis’ the season to start something with Sharpie®!